Welcome to RoadRunes.com. Here is a short flash presentation that hopefully captures the idea behind the name of this site, after watching then it should be fairly obvious what this site is about. For an explanation of the ideas and images it contains go here. For more about me, see “I’m a Lucky Man“. Specifically, this is a site about the “Zen” of motorcycling and all it entails. What I’ve tried to capture within these pages is the essence of the motorcycling experience, in both words and photographs, by sharing my thoughts and impressions of the ride, the exhilaration and the sense of freedom that comes from seeing the world from the seat of a two wheeled mechanical beast. As such, this is not a “Biker” site, it’s a “Rider’s” site and yes, there is a difference, as I tried to explain in my article called Biker, Rider or Just Plain Nuts. So if you’re looking for stuff about cruisers or chrome, Biker Babes, or leather you’ve come to the wrong place, there is plenty of that elsewhere. Nor is it brand specific, because what counts is the interplay between the rider and the ride, not the machine per se. For me riding is a very personal experience, it’s not a hobby, it’s a lifestyle. It permeates every facet of my being. 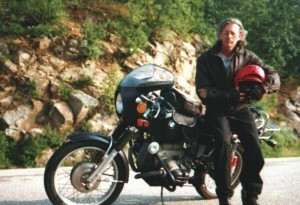 I started riding in 1965 and I ride pretty much year around, usually averaging fifteen to twenty-five thousand miles a year. I ride because I can’t imagine NOT riding. After a ride I went on in 2000 to Seneca Rocks WV, a riding buddy nick named me RocketMan, which has grown on me over the years and which I now use as a pseudonym for my motorcycle related ramblings. Since conceiving of this site, I have decided to include some of my other writings, so while not totally dedicated to motorcycling, the fact that motorcycling has in many way inspired me to start writing again, it still stands as the main theme of this site. So take a look around, hopefully you will come to better understand what drives me and others like me, to ride. Perhaps it might even spark some hidden desire lurking within you to learn to ride and join me on the road.